But soon after starting to bake gluten free, it became apparent to me that the popular starchy white gluten free flours used by most gluten free cookbook & recipe authors (while not hurting my gut) were doing serious damage to my blood sugar and my waist line. Obesity, high blood pressure, elevated cholesterol levels, diabetes, etc... ALL run in my family. Research is starting to show how diabetes, celiac disease, and gluten intolerance are often linked genetically. Therefore, what are gluten free folks doing eating all of these super starchy, simple carbohydrate flours when diabetes and blood sugar disorders so are closely related to celiac disease? I've been overweight most of my life. About two years ago I was diagnosed with the high blood pressure & high cholesterol that is so exceedingly abundant in my family. They were NOT diagnoses I was thrilled with. Seeing the pattern of being overweight and having elevated levels of these unhealthy medical problems has made me very aware of my diet and what I need to do to prevent the onset of diabetes. One of the first places I could start was changing the types of flours I used in gluten free baking. One of my main goals in baking gluten free the past few years has been to create recipes that are not only delicious, but are as healthy and low glycemic as possible. Websites like Meghan Telpner's Making Love in the Kitchen, Elana's Pantry, and the Spunky Coconut have helped me to re-learn how to bake gluten free in ways that are much more healthy, low glycemic, and good for my body. Most often these days I stick with low glycemic, mostly grain free baking. For baking recipes in this manner I use blanched almond flour, coconut flour, and for a bit of lightness arrowroot starch. It's the only almond flour I buy. The company doesn't pay me a dime (I wish they did! lol). It's just a good flour, period. I learned about using the Honeyville brand from Elana, and she's right... Other brands of blanched almond flour (in my opinion) just don't compare to the quality that you get with this brand. Almond flour is a naturally gluten free flour (and the Honeyville brand is CERTIFIED gluten free), it's high protein, low glycemic, and is nutritionally a great option. I love using almond flour for recipes because it's so insanely simple. So often you make recipes for cookies, muffins, bread etc... and just use this one flour. That's it. No xanthan gum, no combination of flours, etc... Simple. Easy. Healthy. I actually have not tried any other brand of coconut flour, so I don't know how they compare to the Tropical Traditions brand. I've been using coconut flour for several years. I actually started to use this flour before I tried almond flour. The neat thing about baking with coconut flour, is that most often the things you bake don't taste like coconut. (At least I don't think they do.) I personally prefer to combine coconut flour with another flour like almond flour instead of using straight coconut flour recipes. 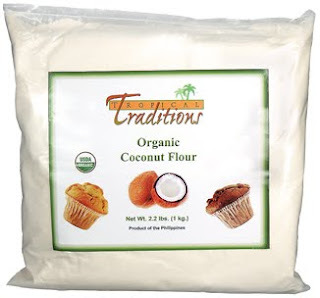 Coconut flour, while expensive initially, is often a practical & economical choice of flour because most recipes call for so little actual flour. Coconut flour is VERY absorbent and therefore you don't need very much of it to create a lot of volume. You generally use 3 eggs in a recipe calling for 2 tablespoons of coconut flour! If you would like to use coconut flour exclusively, check out this book by Bruce Fife. 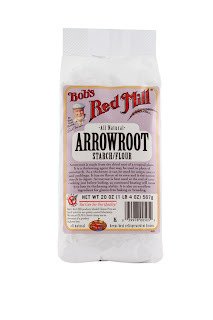 Bob's Red Mill Arrowroot Starch. The only starch flour I use anymore is arrowroot starch. It's lower on the glycemic index ( I cannot find the original information I used to verify the glycemic index -- yet while I cannot "prove" it's a better starch, I still prefer this gluten free starch to all others. --csf 8/25/11) Like most starches it really doesn't have that many health benefits, but it does provide a lightness to gluten free baked goods without compromising your health. 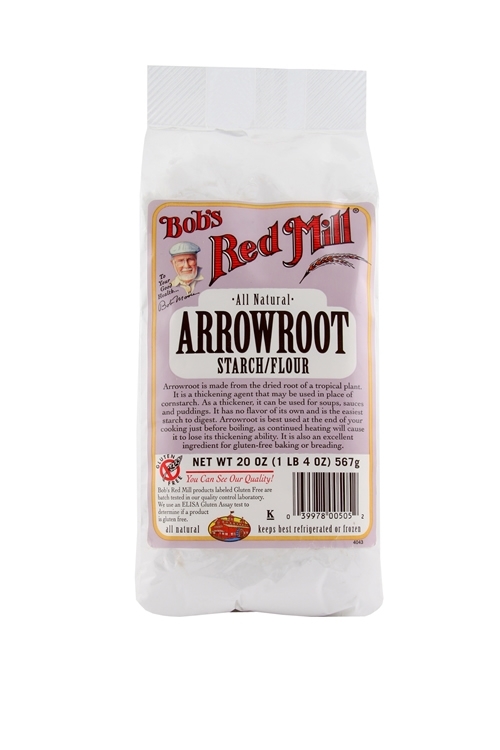 I haven't tried other brands of arrowroot starch, simply because I can buy it in bulk from Bob's Red Mill. One thing I really like about arrowroot starch is it's great both in grain-free gluten free baking and in whole grain gluten free baking. It means I only have to stock one little starch in my small pantry space! If you prefer not to use arrowroot starch in your baking, just remember you can use any other starch in place of it in a one-to-one ratio. + a binder = either 1/2 tsp. of xanthan gum or guar gum -OR- **2 tbsp ground flax seeds (ground flax can be used in place of xanthan gum in MOST recipes -- please note that this does NOT work well in yeast breads!) Most gluten free baking requires a binder/texture ingredient such as xanthan gum or guar gum which sort of "replaces" the gluten that gives such great texture in wheat baking, especially for yeast breads. Many baked goods like quick breads can actually be made without the gums... since muffins, cakes, coffee cake etc... do not need to have the same somewhat resilient texture, tight-crumbed texture as yeast bread. That's it. I don't have any rhyme or reason as to why I choose a specific gluten free whole grain. Whatever is in my pantry I use. Generally I keep sorghum, millet, and brown rice in my pantry. Arrowroot starch is the only starch I keep in my pantry because it's lower glycemic & because it's not grain based. This simple ratio of 2 whole grains to 1 starch works for nearly every recipe I try. It's easy. It's simple to stock in my pantry. It's healthier than using white flours and grain-based starches. A whole grain of brown rice finely ground into a flour. It's one of my favorite whole grain flours. I always have it in my pantry and it's usually the 1st whole grain I use in a recipe. It has a very mild flavor, it works well in every recipe I use. My husband would call it "low maintenance" (unlike his wife... lol) If you had to pick two whole grains to stock in your pantry, this is #1 choice I'd go for. 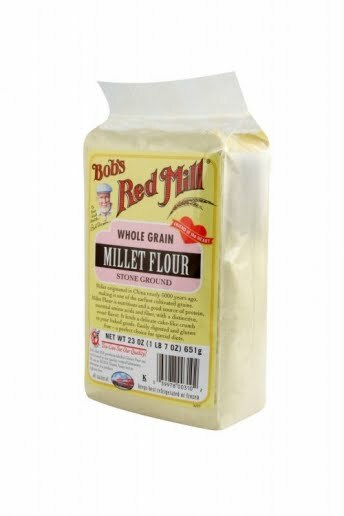 I've always used Bob's Red Mill. Some people say that they prefer Authentic Foods superfine ground brown rice flour, but I've never had a problem with Bob's Red Mill. Gotta love buying in bulk and low shipping costs! An ancient grain that's been used in other parts of the world for centuries, it's relatively new to the US food market. Sorghum flour is high in insoluble fiber and it has a slower digestion rate, which makes it not only suitable for celiacs, but also for people with diabeties or high blood sugar. If you wanted my pick for #2 whole grain to keep in your pantry, it would be sorghum flour. Some people don't like the flavor of sorghum, but I love it! I think it makes gluten free baked goods taste very similar to their wheat counterparts. 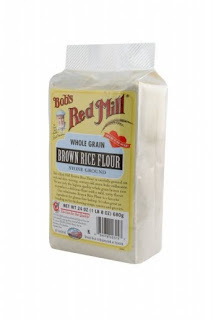 Sorghum and brown rice flour are the only whole grains that are ALWAYS in my pantry. 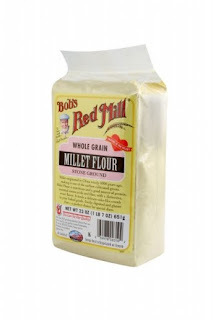 Again, I personally have always used the Bob's Red Mill brand and I'm very happy with it. Another ancient seed grain that's been largely ignored in the western world up until recently. Probably more often than not you'll find it as the main ingredients in some bird seeds. My favorite aspect of millet flour is it's very mild flavor. Most people who do not like the taste of sorghum, really like the mild nutty texture of millet flour. 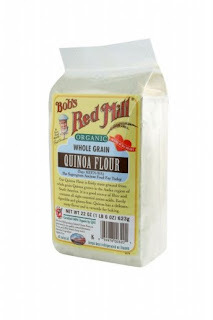 For some reason I generally buy a box of sorghum flour and millet flour at the same time. I'll use all the sorghum flour first, and then I'll use the millet flour. Don't ask me why. I'll pretend it's for variety. I use them equally and exchange them 1:1 in baking. It's mildly flavored. A whole grain that's lightly colored (so it doesn't seem like a whole grain!) and it's healthy. Another win win! As with the others, I solely use Bob's Red Mill. The most recent whole grain addition to my pantry. I really love the flavor of quinoa flour. I don't use it nearly enough. Quinoa (pronounced - "keenwah") is a hearty, high protein flour, high fiber flour that's really a great option for celiacs and those with high blood sugar, sugar sensitivity, or diabetes. Quinoa flour also seems to naturally bring out the sweetness baked goods (even when you don't use much sweetener! ), it's a lighter high fiber flour, and it's really delicious. I definitely plan to use more quinoa flour in my future whole grain baking! Again, I purchase mine from Bob's Red Mill. Tapioca starch - Lots of my older recipes use tapioca starch. I've realized over the past few years that tapioca starch tastes very bitter to me. I've also had readers complain about some recipes having a bitter taste. I've found that it's the tapioca starch that causes this bitterness. I don't know if it's a personal taste preference, if tapioca goes rancid quickly, or what exactly causes this. But I've stopped using tapioca starch, not only because it's so unhealthy, but because of the bitter aftertaste. I substitute arrowroot starch 1:1 for tapioca starch in any recipe calling for tapioca. If you have a baked good that seems to have a bitter aftertaste, check the ingredients for tapioca starch. Sugar - I seldom, if at all, use sugar in recipes anymore. I will be doing a post soon on my preferred natural sweeteners. Generally in most recipes now, I use agave nectar, honey, or stevia. Gluten Free Flour Substitutions - In ALL of my recipes, EXCEPT YEAST BREADS, you can substitute any whole grain for a whole grain, any starch for a starch. If I used brown rice flour and all you have is sorghum flour, use sorghum flour. If I used arrowroot starch and all you have is potato starch, use it! It will work! Yeast breads are the only recipes that break this rule. Yeast breads are tricky and the ratio of starches to whole grain is very important in getting a bread to rise correctly. So there you have it... a glance of the ingredients in my gluten free baking pantry. What flours do you use most often in your gluten free baking? Why do you use them? What gluten free flour combinations seem to work best for you? Share your favorite gluten free baking ingredients in the comments below! Thank you for this! I get overwhelmed with the gluten-free baking sometimes, not to mention turned off by the taste a lot of the time. I have discovered that I love teff flour, too. I keep telling myself I'll make my own injera, but never get around to it. Thank you, again! hunterslyonesse - You're welcome! I get overwhelmed too! I think it's better to keep it simple, healthy, and stick with what you like! Gluten free does NOT have to be complicated!! This is awesome! You can never learn too much about GF baking. And you've finally convinced me that I need some Honeyville. Been thinking about it for months! Totally bookmarking this. Thanks. G - I'm so glad this is helpful to you!! I can definitely detect the bitterness in tapioca starch. So glad you're a whole grain girl too! Carrie - excellent post. Makes a whole lot of sense and is easy to digest (pardon the pun!). Excellent information! I recently moved in with my boyfriend who has a gluten sensitivity and has recently started a gluten free diet and as I'm learning how to cook gluten free for him I was noticing how most recipies had a really starchy flour base but I had no real clear idea on how what else I could be using or how to convert it. This is a very helpful reference for me :) Thanks! Rach - I'm so glad this was helpful to you! The starchy flour base has always bothered me, but people use it because the results are light and fluffy like "white" flour... unfortunately it's just not healthy at all! I'm so glad these tips will help you change your recipes! :-) Thanks for commenting! Carrie, what a great informative post!! I, too, use a lot of almond flour, coconut flour, and arrowroot! 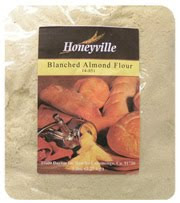 I love Honeywell Almond flour, and Digestive Wellness has one that is almost even better and finer! And, I totally agree that Tapioca starch gives a strange aftertaste. Not a huge fan of it in my flour blends! This is a great post for those who are trying to figure out this whole gf baking thing!! I'm going to share it on my Facebook page right now. Kim - Thanks so much!! I really appreciate your comments! I'll have to try the almond flour from Digestive Wellness sometime! I've heard of that wonderful website!! I'm so glad I'm not the only one with tapioca starch issues! lol... I noticed it for years and I didn't realize what it was! I kept blaming the baking soda! Nope... it was that durn tapioca starch that everybody loved!! Thank you for this post! This is all only a few months old for me! Overwhelming is such an understatement! lol Every bit of information is VERY helpful!!! The one thing I did learn from another source is that I have to avoid millet. I am hypothyroid and millet supresses thyroid function, so anyone that has low thyroid function or diagnoised hypothyroid should stay away from it! So much to wade through, but I am so grateful to your site and others for making this journey a bit easier!!!! Croneintraining - Thanks so much for the info on the millet flour. That might be a reason that I naturally opt for the sorghum before using the millet! I think our bodies can tell us things without us making the connection... may have to rethink millet! :-) SO glad this is helpful to you! Great post Carrie! Wonderfully informative. I get asked about GF baking all the time- it's easy to fall back on corn/potato flour as so many do but really won't do much for anyone's health. I'll be printing this one out! Thanks Carrie! Meghan - Thank you So much!! I know what you mean about people relying on the simple white flours for gf baking. Sure it tastes, great, but it truly wreaks havoc on our bodies!! Sarah - Thank you!! I'm So glad you noticed the off taste of tapioca as well! It took me SO long to figure out what it was!! And yes, I heart Leslie!! I need to get back into my Leslie routine!! Anyway, this is a great post, full of valuable information and meaningful personal insights! Melissa - Thank you so much for this wonderful comment! I definitely struggle with weight, and your advice as a nutritionist is absolutely refreshing. I definitely am sticking with whole foods & less baked goods...and using grain free flours when I am baking! thanks for this great intro...we are gfcf over here and are new to navigating the baked goods terrain. Great rundown of flours! I use nearly every one of them - although I need to learn to use coconut flour more often. For some reason, I have never bought millet flour. Don't know why. Maybe I should! what about adding xanthan gum, is that necessary when subsituting the flour? Anonymous -- kicking myself for not answering your question sooner! YES, in whole grain baking you will need to add a gum to your dry ingredients as a binding agent. BUT for recipes with only almond flour or coconut flour -- a gum is not needed! :-) Another nice thing about low glycemic gluten free baking! Thank you so much for the great summary. I've been gf for about 6 months, and have been looking for ways to use more whole grains and less starch. Thanks for putting it together for us all. don't know why i didn't look at this post earlier. Had tried a pancake recipe from Land O'Lakes my entire family loved but there was a 'bite' or bitterness to it.. I thought it was the rice flours they used...nope it's that tapioca flour. Thank you, thank you for pointing that out. I have a question regarding almond flour. Can't you grind the almonds in your food processor or coffee/nut grinder so you get fresh flour whenever you need it vs buying it and not knowing how long it's been ground and bagged. You can purchase almonds at Costco pretty inexpensively. There is definitely a science to GF cooking and we so appreciate you experimenting and explaining it to us. thank you again for remaking your older recipes into healthier ones. Can't wait to try out some cookie recipes so we have our favorites for Christmas cookies. How do you afford almond or coconut flours? The cost of 5 lbs. of one of these is approximately equivalent to *50* ls. of whole wheat! Another question. (Can you tell I'm new to GF cooking/baking?) 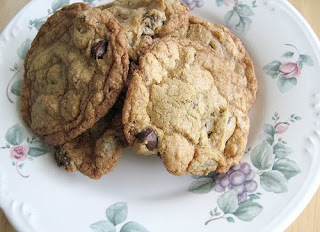 Soooo many GF flour mixes use starches - that's why I was glad to see your post! But if I'm used to baking with 100% whole wheat flour - no added white flour or plain wheat gluten - will I really miss the lightness of the added starches? Or would those be more noticeable to someone accustomed to baking with at least part white flour? I just received a bunch of flours to prepare foods for my recently GF husband. My mother-in-law keeps her flours/starches in the freezer for preservation. Do you have any other ideas for storage of all these flours? There are so many bags etc. I've attempted to put some in air-tight containers. Just wondering if you have a system or suggestion??? Thank you so much for this simple explanation of gluten-free baking items! I am just starting to try out gluten-free eating to see if it will help with my digestive problems and need to make most of my own food because of other dietary restrictions (low-sugar, low-dairy). I was getting freaked out by the apparent variety of flour grains I would need to purchase to bake anything, plus xanthan gum, etc. Your list is simple and clear and I feel it is just the perfect start for someone like me! Thank you for taking the time to share! Thank you all the info! I am starting a 1 month long GF trial to see if I may have celiacs (decided with my doctor to do this instead of going straight for the biopsy). This has answered a lot of my questions about baking, so thanks and happy baking to everyone! Thank you for cutting down much of the confusion! I was thinking I was never going to get it right, or find a way to make GF/low GI palatable. I have question I haven't found an answer to yet: What to use to make good tasting yeast breads? Thank you for clearing up much of the confusion, especially about the tapioca flour! I have question I haven't found an answer to yet: What to use to make GF/Low GI yeast breads that taste good? I make most of our bread, and I'm really struggling with this one. I prefer not to use mixes, but to make my own. Wow! Thanks for this great information. I have been struggling to understand all the differences for some time. It's great to find so much great information in one place! Thanks again! Thanks for making this very simple. I know there is a lot of info out there about these flours but I too have been looking for a healthier way to bake. Perhaps I have not looked in the right places because most everyone uses white rice flour, tapioca, etc. or has never put it quite as baker friendly as you have. Thanks!! Thanks for making this baker friendly and so simple. I too have been looking for a healthier way to bake and most recipes call for rice flour, tapioca, etc. and I have been worried since none of these flours have the greatest nutritional value. Thanks for helping me put a smile on my son's face (& me too)!! Grandson has tree nut allergys so almond flour is out. What can I use to replace almond meal or almond flour in flour mixes. I don't know if you still use agave nectar but it is actually worse for you than high fructose corn syrup! The low glycemic part of it is a bit deceptive. Otherwise, thank you so much for this post. I cannot tolerate coconut flour and I'm on a very limited budget. I have been experimenting with soaked bean mash with excellent results. And a bag of beans is far cheaper than bean flour! By soaking the beans for 24-48 hours in warm water with 1/2 tsp baking soda, it eliminates the "digestive issues" beans can cause. Once they've soaked and are cooked, throw them in the food processor to mash and freeze in 1/4 cup portions. They can be used cup for cup. I've used just beans up to now but I'm going to try adding some brown rice flour as well. 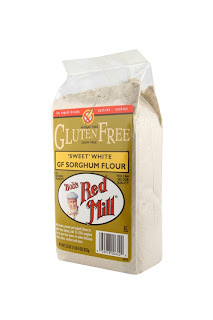 Do you think the sprouted version of these gf flours would work just as well, for example sprouted sorghum, sprouted brown rice, sprouted millet/quinoa? I really like your site.and really enjoyed this post.Very helpful,, the style of this article I'm like, really pretty good.